A suspect led law enforcement officials on a slow-speed chase through multiple counties on Thursday, May 5, 2016. 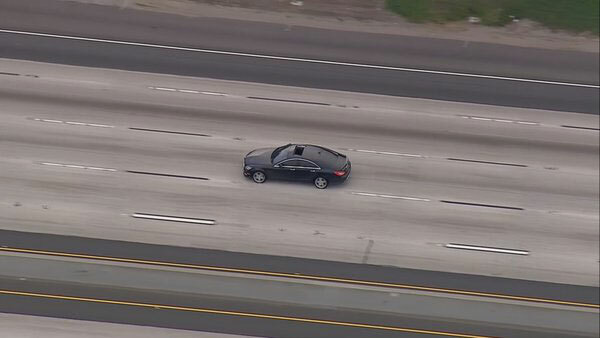 BUENA PARK, Calif. -- A suspect wanted for attempted murder led the California Highway Patrol on a slow-speed chase through multiple counties on Thursday. Officials said the pursuit began on the 91 Freeway heading eastbound near Central Avenue in Compton. The Los Angeles County Sheriff's Department began pursuing the driver for attempted murder and assault with a deadly weapon. The suspect, who was in a Mercedes-Benz, hit several cars on the 91 Freeway while trying to weave through stopped traffic. The suspect led authorities through Orange County in the Buena Park area and into Riverside County. The driver's tires were hit with a spike strip and the car began falling apart as the suspect used a barricade to guide the vehicle down the 91 Freeway. The vehicle became disabled in the Corona area and a standoff with CHP officers ensued as the suspect remained in the car. The 91 Freeway was shutdown both eastbound and westbound near Green River Road in Corona.